WASHINGTON, April 16, 2010 - General David Petraeus, Commander of the US Central Command, said US success in Afghanistan is contingent on "getting the inputs right," and making sweeping changes, such as boosting Afghani security to 100,000 forces by 2011. Drawing on his experience as Commanding General of Multi-National Forces in Iraq, where he oversaw a massive counter-insurgency campaign, Petraeus said he was capable of making the same adjustments in Afghanistan that proved vital in Baghdad. 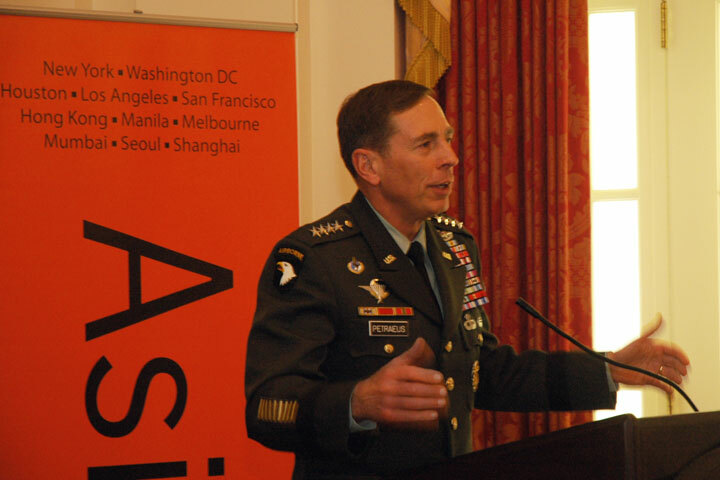 Petraeus spoke in conversation with Jack Garrity, Executive Director of Asia Society Washington, at the Army and Navy Club in the District of Columbia. The general argued that it was vitally important to bring those who worked in Iraq to Afghanistan to head operational institutions because "getting the big ideas right, the right campaign plan, the right counter-insurgency guidelines and tactical directives helps reduce the loss of innocent lives." Garrity asked him how to measure success in the region, and to explain the relationship between security and nation-building on the ground in Afghanistan. "Once you get security, everything else becomes easier," said Petraeus. He explained that the surge provided enough security to allow development to proceed. Incidents of violence are down by 90 percent since their height—from about 220 attacks per day to 15. That number has remained about the same over the past six months. Petraeus told the audience to "remember that the surge wasn't just the 25,000-35,000 extra US forces; the real surge was a surge of ideas which focused on securing and serving the population... [This] incurred enormous risk but was necessary because without that we couldn't have broken the cycle of sectarian violence." Responding to questions from the audience, Petraeus talked about the importance of being culturally sensitive and the improvements the US soldiers were bringing to Afghanistan. He cited tremendous gains in education, access to basic healthcare, cell phones, electricity, and a new expanded network of roads. In both Iraq and Afghanistan, Petraeus said it was absolutely critical to educate US troops to be sensitive to the local culture because "you cannot operate successfully in these kinds of endeavors if you don't have a nuanced appreciation for local circumstances... and history."